Good Times in Htown – Heels Go Click. In case you’ve been living under a rock since April, now is the time to peek your head out, look around, and enjoy the excitement. That’s right – Houston is a sports town again! I don’t know how long this will last, so we best enjoy it now. Welcome to Clutch City! Your Houston Rockets are beginning play in the NBA Western Division Finals tonight vs. the Golden State Warriors. I’ve watched more basketball games in the last 3 years than I have in my entire life, but other than commenting on James Harden’s beard or Dwight Howard’s arms, I can’t offer much. B is the basketball fan, and since we ditched cable a few months ago (it’s refreshing, you should try it), it’s been like the 1920’s in our house, gathering around the radio to listen to the game broadcast. This is the first time in 18 years that the Rockets have made it this far. That means I was graduating high school – yikes. That makes me feel old. But it puts it into perspective, doesn’t it? Houstonians are STARVING for some championship basketball. Belly up, folks, and enjoy. The buffet is open. At least for 4 more games. And, can we talk about your Houston Astros? Holy Toledo, their bats are hot! And the pitching is nails. We have a (nearly) solid rotation – I think Oberholtzer needs to be demoted, and we need to sign Cole Hamels. AND we have a bullpen – tho I won’t get into how I feel about Qualls. I cringe every time he waddles in from the bullpen, but he hasn’t been completely awful. They’re calling players up from the minors when they’re ready. The players are having fun, and everybody is getting hits. Heck, the team is leading the league in homeruns and stolen bases. And, we’re in first place in our division, the AL West, matching the best start in club history (tying the 1998 team’s hot start). If I’m dreaming, I don’t want to wake up. Now, is this the year, We. Go… All….. The…… Way.? I don’t think so. But, I’d sure love them to prove me wrong. It’s a great time to be a Houston Sports Fan! 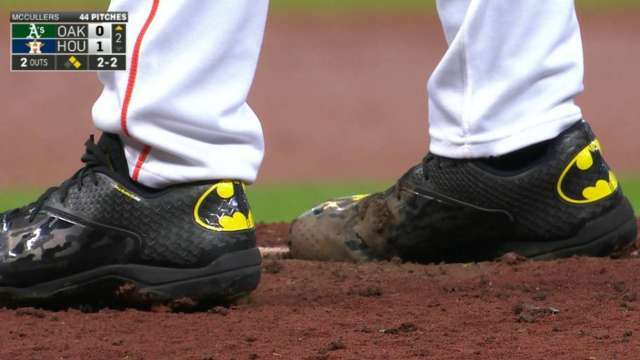 Lance McCullers, a prospect that got promoted from AA Corpus Christi straight to the pitching mound at Minute Maid Park opted to sport Batman cleats for his first career Major League start last night.